The photograph reproduced on the front of the current issue, and below, was taken in Manhattan’s Central Park during the early years of the Great Depression. In the foreground, a row of small, dark, box-like structures stand in stark contrast to the snow-covered ground and frozen reservoir, and perhaps more strikingly, to the high-rise apartments on the opposite avenue. 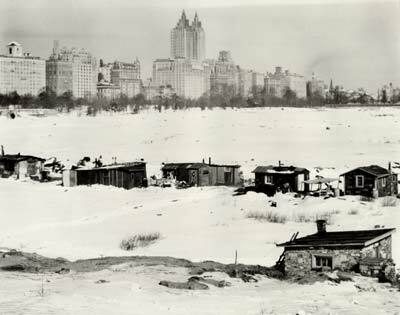 The Eldorado, the two towers set back and center, was erected a few years earlier, in 1929, and constituted a full city block of apartment living; the shacks in the fore housed a community of otherwise homeless New Yorkers. In the tradition of the socially conscious documentary photography of the period, the photo emphasizes profound disparity in its depiction of extreme poverty set against relative comfort; in its composition, with the vast blankness of the field and ice that separates the plane of shacks from that of buildings; and immanently, in its black-and-whiteness. Hoovervilles, the disparaging namesakes of Herbert Hoover, whom many blamed for the Depression in the early 1930s, were built on the edges of towns and cities, in parks and on riverbanks. They were public spaces, settlements whose visibility made them spectacles as much as necessities. Despite a dearth of means and relative powerlessness, America’s poorest citizens cooperated and organized communities—some small, some sprawling—and provided themselves with the physical and social infrastructure the government would not. Unemployed bricklayers and carpenters helped to build the structures that housed themselves and their neighbors. In some instances, localized governments formed. Appointed mayors took on leadership roles and acted as mediators, while committees were organized to handle issues like sanitation and maintenance. On the occasions that city commissioners ordered the razing of these settlements—as happened often when they were deemed unsanitary—residents would stand by as their homes were destroyed. And then they would rebuild. While not all of the citizens occupying lower Manhattan’s Zuccotti Park (and other encampments across the country and world) are homeless or unemployed, many are. Others have left their low-paying jobs or foreclosed-upon homes to occupy the park and stand in solidarity against corporate greed, a decades-long class warfare by 1% of the population, and governmental malfeasance, all of which they believe to be responsible for the country’s economic woes. Many others have expressed solidarity by contributing materials and money. Still others occupy on their days off. Occupying a public space is a lot like casting a vote, except that in the case of occupation, the polls don’t close, and the issues addressed are more diverse than those that appear on public ballots. Just by showing up, demonstrators pledge their support and hope that their efforts will be reflected in changes of opinion, and ultimately of policy. OWS protesters appear to recognize that modes of political demonstration are not limited to carrying signs and chanting demands. The term demonstration is taken literally when they seek to show how something might be done better, when they demonstrate by setting an example. The OWS movement aims for their demonstrations to be reflected in, and serve, a larger set of processes. Take, for example, the cooperative efforts and overall organization that make the long-term occupation of a public space possible. In only eight weeks, OWS democratic demonstrations have been carried out in impressive quantity, and with an apparent sense of fairness, efficiency, and accountability that is remarkable. Perhaps their most impressive (and ongoing) demonstration is the organization of the encampments themselves. Take note: all who arrive at the park will be fed and sheltered. On October 29, 2011, the first snow of the season battered New York and other cities along the I-95 corridor, with several inches of snow, sleet, and rain. Demonstrators stuck it out, their website calling for donations of winter gear—warm clothes, boots, sleeping bags, and cots and pallets to get people and tents off the cold ground. And these provisions were supplied. In light of recent events—and long-term economic prospects—we may find ourselves reviewing images like the one above, and adjusting our focus. In the distance, beautiful, untouchable towers blur against pale winter sky. The shacks, on the other hand, bear keen details, and are tangible. Perhaps most importantly, they don’t appear to be going anywhere.